At the Canal Bank Café in Dublin, Helen McEntee TD tells Graham Clifford she wants to do things her way. They say you can tell a lot about someone by the way they walk. On a murky, grey and grim afternoon on Dublin's southside a tall young woman strides confidently towards the front door of the Canal Bank Café on Upper Leeson Street, the wind playing with her long blonde hair. I spot her from the window. As she takes her seat inside, I can't help but think this lady is a force to be reckoned with, a 'tough nut' as they say down my way; and so, when I hear that her self-assured veneer covers a far more bashful interior, I'm a little surprised. 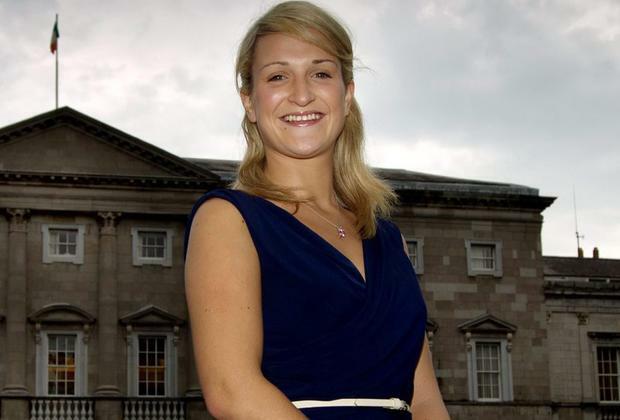 "Sometimes, I still walk into a room and stand at the back before someone shoves me up the front," explains Fine Gael Meath East TD Helen McEntee, the second youngest TD in Dáil Eireann. "I still find it hard to believe that people are there to see me." It's just over two years since the 28-year-old Dublin City University (DCU) graduate was elected in a by-election, caused by the tragic death of her father Shane McEntee. The well-respected politician and businessman took his own life on December 21, 2012, two days after his 56th birthday. His death shocked the nation and his funeral took place on Christmas Eve. "My dad was very passionate, he loved what he was doing and loved working with people - we couldn't understand what happened. It was absolutely devastating for all of us. It's hard to believe that it's over two years since I've seen him." At this point her voice trails off, and we pause the interview. Speaking about the grief and loss is still understandably difficult. Helen worked with her father for three-and-a-half years before his death. A student of economics, politics, law and media, she was seen as a major asset for Shane who served as Minister of State for Food, Horticulture and Food Safety at the time of his passing. We resume our lunch and our conversation. Helen tells me there have been days over the last two years when she's felt so angry about her father's suicide and the hoard of unanswered questions. "I've been angry - kicking, screaming and all the rest, and there are still times when I am, but I've learned that I can't change what happened. I could spend the next 20 years being angry, but it won't make one bit of difference. Death is unfortunately a part of life that we have to deal with in our own way." In the days after Shane's death, his brother Gerry suggested abuse via social media may have been a contributory factor, but Helen is sure it wasn't. "He (Shane) wasn't using Twitter and I managed his Facebook account, so I'd know if there was an issue - and he wasn't using separate social media," she says. With a large extended family, the McEntees have been GAA royalty in the Royal County, over the years. Through Shane's association with sport, business (he ran a pub in Nobber), farming and politics, the circle of support has grown in strength and in their hour of need, the friends of the McEntees were not found wanting. So, less than four weeks after her father passed away, Helen decided to contest the resultant by-election in Meath East and those same supporters helped get her over the line. "Running was what he would have wanted me to do I think," she says. "I'd been working with him on so many issues and it would have been heart-breaking to see them come to nothing. My family were concerned though, and wondered if I was doing the right thing. "I was so positive throughout the campaign and they worried that if the outcome didn't go my way I'd find it hard to deal with that." Helen was the only woman running in a field of 11. After receiving over 9,000 first preferences, she took the seat with relative ease from Fianna Fail's Thomas Byrne. The shy country girl suddenly found herself on the front cover of every newspaper. In the space of three months, her life had been turned upside down. "It was so challenging at the start, so tough because, as well as dealing with being a new TD, I was also grieving for my father. There's such a massive difference between working away in the background and being in the forefront. I had no choice but to come out of my shell. "My first time speaking in public to a large crowd was in front of the Taoiseach and a room of 600 people and the media, and my first television appearance was on Vincent Browne's programme. It was scary, but I rose to the challenge." When elected, Helen was asked if she wanted to use her father's old office in Leinster House, given the fact she had worked there alongside him for years before. She decided not to, but now operates from the office next door. Not a day goes by when she doesn't think of him - I dare say not an hour. "In my work, when I'm covering a particular topic, I ask myself, 'What the hell would he have done with this? Is this how he would have acted?' He's always there with me." But Helen McEntee is not Shane McEntee. They may be cut from the same cloth, but the approach is different. "When I was running for election in 2013, I was kind of fighting against the thinking that 'sure she's only there because of her dad', you know, the sympathy vote. "While I would never try to distance myself from him and I am so proud to be his daughter, I'm also my own person, elected on my own merit and with my own ideas," she says before sipping her black coffee. In recent months, she's impressed on issues such as the Gender Recognition Bill. She says she is a strong supporter of marriage equality rights, and will be canvassing vigorously for a 'Yes' vote ahead of the upcoming referendum. Issues such as improvement to broadband and telecommunications networks, and further assistance to entrepreneurs, are high on her agenda. As one of only two TDs in their 20s , she is particularly keen to tackle issues relevant to her generation. She continues to focus on the pyrite scheme in Meath, as her late father did, and hopes those families who are affected will see new homes built soon. As I struggle to twist my linguine around my fork, and look composed at the same time, I ask Helen if she has any ministerial ambitions down the road. "I'd love to be in the Department of Children, but if that comes, it comes. So long as I'm a hard-working and honest local representative that will do me for now," she says. She has mixed feelings about the gender quota scheme, which will oblige political parties to run at least 30pc female candidates in the next election. She believes greater gender and age balance in the Dáil would result in a stronger democracy. She explains: "I wouldn't necessarily agree with quotas but I think it's nearly a necessary evil to kick-start things (in relation to gender equality). "I wouldn't like the idea that you'd need to have a woman on the ticket to reach a certain quota, but at the same time, progress has been so slow that we need this kind of short term solution." But what can a woman bring to the Dáil that a man can't, I ask mischievously? "Well, there are those who say if women had been at the table during the banking crisis, we wouldn't have reached the stage we did. It's impossible to know, but women do look at things with a different perspective to men." She adds: "The Dáil should reflect society rather than being male-dominated. The gender balance is very important in the same way we need younger politicians alongside the more experienced ones." Her boyfriend, Paul Hickey from Roscommon, has been seen as crucial to her own personal success over the last two years. He has been there to help and support her through the darkest of times. He worked for Joe McHugh, now Minister for the Gaeltacht and Natural Resources, for five years, and met Helen while both were working in Leinster House. Paul has since moved on to pastures new, but Helen tells me he has been hugely important in her life over the last two years. "He was and is fantastic support during difficult days." "I hope so," she says. She pauses before adding, "I think he would be," and then she confidently walks out the door. Whoever came up with the theory that your walk is reflective of your personality was onto something. FAMILY: Father Shane and mother Kathleen. Older brother Vincent (31), a film-maker, and sister Sally (26), who works in childcare. EDUCATION: Secondary school St Joseph's Mercy in Navan, Co Meath. Studied economics, politics and law at Dublin City University (2004-2006) before completing a Masters in Media and Communications there in 2010. CAREER: Worked as assistant to her father from 2010-12. Elected in March 2013 to the Dáil in a by-election. Second-youngest TD behind Fine Gael colleague Simon Harris.